You have a new fat tire Electric bike and would like to explore other areas further from home that require you to transport your E-bike. Riding around your neighborhood is great, but riding in national and state parks on trails can be a lot more fun. A car bike rack can be a good solution to get you and your E-bike there. 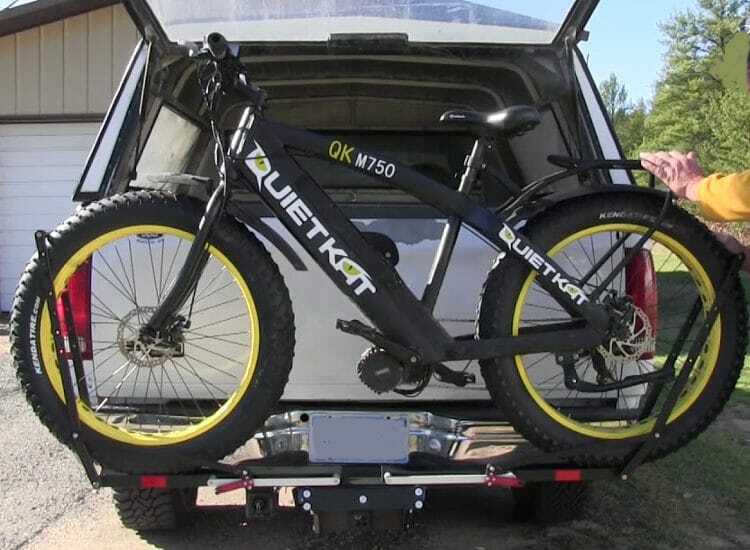 The problem is most car bike racks are designed for conventional bikes and are rated to handle about a maximum of 35 lbs per bike.The average mountain bike weights around 30 lbs and many bikes that are made from carbon fiber can weigh under 20 lbs. ​A typical Electric bike can start at about 50 lbs and quickly go up to around 70 lbs or more for a fat tire E-bike. I have compiled a list of Best Car Bike Rack Carrier for a Fat Tire E-bike that can handle the weight of an E-bike and accommodate fat tires. I picked double racks because it is always better to cycle with a friend and I made sure they can handle a fat tire bike. Keep in mind you will need a trailer hitch to use the Car Rack Carriers. Most are designed for a 2 inch trailer hitch. Here are the best hitch bike racks for electric bikes. Note some racks are rated for 60 lbs and can handle an e-bike but the wheel carrier is not designed for fat tires. So you will need to get the optional wheel holders to accommodate Fat tire bikes. Most car racks are designed for bike weighing under 30 lbs and should be avoided for a fat tire E-bike. Standard four bike rack rated for 140 lbs. An average Fat Tire Electric bike can weigh about 50 lbs for lighter models and close to 80 lbs for a fat tire E-bike. You will need a Car rack that is rated for at least 120 lbs to handle two bikes. If you are good at math you can calculate that 2 fat tire E-bikes surpasse this number. Fortunately the battery that generally weighs between 7 and 10 lbs can be removed to lighten the load. It is a good idea to remove the battery regardless and bring it inside the vehicle. Be sure to keep the battery in a cool location. This prevents theft and overheating when sitting in direct sunlight. When driving at high speed down the highway in the rain can act like a pressure washer and water can get into places it should not be. A good investment is a ​good quality bike cover. A cover will protect the bikes from the rain. Many covers have a lock. I do also believe out of sight out of mind does further reduces theft. 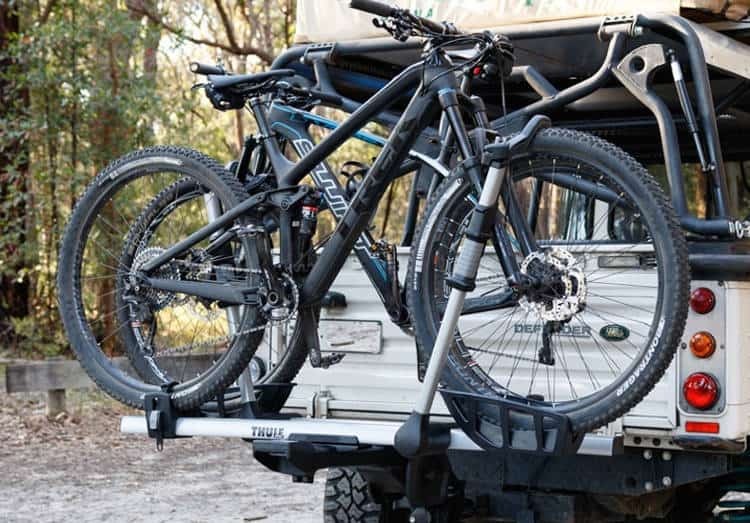 Thule Easyfold XT Hitch Mount Bike Carrier is one of the better-known Bike Rack Carriers and for good reason. Not only has this product been around for a few years they have continually made improvements. The EasyFold XT bike carrier has a convenient foldable design to easily store in your vehicle when not in use. The Thule Easyfold rack has integrated wheels on the bottom to make it easy to move. It has a handle on top to make it easy to carry and overall is a quality made product. The Load Capacity on the Thulu Easyfold is 130 lbs. Two E-bikes weighing 70 lbs adds up to 140 lbs which is more than maximum rating. You will need to take off battery to reduce the weight. The Thule EasyFold XT 2 can handle a fat tire up to 4.7 inches and the Thule T2 Pro XT 2 can handle a tire up to 5 inches. Hitch Receiver 2" and 1.25"
Folds up for easy storage or to put inside the vehicle. If you have a hatchback car or Suv you should have no issues but if you have a car with a small trunk check to see before if it will fit. The dimensions are 48.4 x 25 x 26.8 inches. The ability to lock your bikes to the rack with locks included. Folds out for easy trunk access. 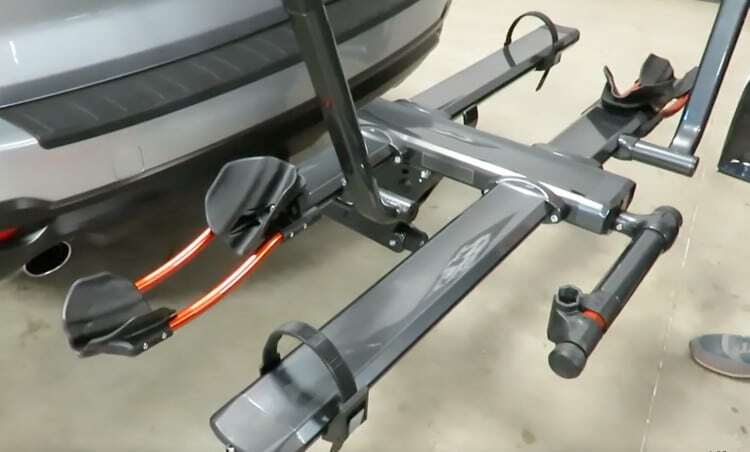 Higher priced than many racks on this list but it is a very good quality rack for lighter E-bikes, the Hulu EasyFold XT Hitch Mount Bike Carrier available at Amazon will serve you well. It also has included a foldable loading ramp that integrates into the rack for convenient loading and unloading. The Hollywood rack is another very popular car bike rack. It has one of the highest weight capacity in the market. It can handle 2 80 lbs per bike for a total of 160 lbs. Making the Hollywood rack ideal for fat Tire E-bike owners. They do have a few different models to choose from, both have the same 80 lb weight capacity but one can handle 3-inch tires and one can handle up to 5-inch tires. If you have a fat tire bike be sure to get the one that is rated for 5-inch tires like this one from Amazon. Another nice feature is the Hollywood rack is part of a system. The optional Rack Valet makes it easy to move around in your garage or driveway to make it easy to install and remove from the back of your vehicle. The rack can carry two electric bikes (up to 5 inch wide tires) with up to a 60" wheelbase with a maximum capacity of 80 lbs per bicycle. Remove the battery from your bike when before putting the bike on the rack. Compared to other heavy-duty car-bike carrying racks the Hollywood rack is modestly priced. You can get the rack and the valet for the same price as other racks. A great option that makes it easy to move around. It has many positive reviews from Amazon. Saris makes racks for heavier bikes. 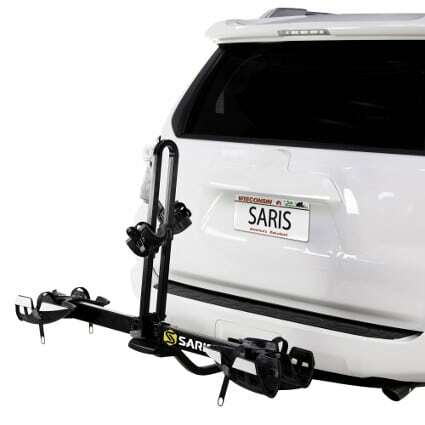 The Saris Freedom Ex 2 Bike Rack is rated for 2 bikes up to 60 lbs each. For a total of 120 lbs. The Ex 2 can be used with lighter E-bikes will not cut it for two fat tire e-bikes. The Saris Freedom Ex 4 Bike Rack is rated for 4 bikes total carrying weight 190 lbs total. The Ex 4 will work if you want to carry two fat tire E-bikes or if you carry a mixture of standard bikes and E-bikes. They are light, tough, work well, and are made in the USA, also I have read they have excellent customer service. Works with both 1 ¼” and 2″ hitches. Has a tilt feature to allow easy access to your trunk. Even when loaded with bikes. Has integrated locking system and reflectors to make your rack more visible at night and more secure when parked. The Saris Ex 2 Ans Ex 4 may work for some fat tire E-bikes but may come up short for heaver e-bike. Be sure to calculate the weight of the bikes you plan to carry before purchasing any Saris rack. The Kuat NV 2.0 Bike rack is one of the slickest looking bike racks on my list. The rack has a nice gloss powder coat finish with orange accents. It not only looks good but has a solid build. Weighing 52 lbs the Kuat NV 2.0 is not the lightest rack, but it will work with many fat tire ebikes. Removing the battery on many E-bike will bring the weight down to under 60 lbs. The wheel base holder can accommodate tires up to 4.8 inches. Dedicated 2” model carries two bikes and with the optional NV 2.0 Add-on the Kuat NV 2.0 can carry up to 4 bikes. I contact the manufacturer and getting the 4 bike Add-on is not advised for heavy bikes. With the Add-on the over all rating goes down and no single bike can exceeds 40lbs. Total 160 lbs. The Kuat NV 2.0 Bike rack is a solid rack that is great looking and will work with two E-bike weighing under 120 lbs. See Amazon for pricing. The 1up company is a US based company that makes heavy-duty bike racks that can handle heavy E-bikes. If you have a few big heavy E-bikes this is the rack for you. It has the highest weight capacity of any rack on the list with a total capacity of 275 lbs. ​This tray-style hitch rack is made from solid aluminum. 1up has been making bike racks for a number of years and have many happy customers. A basic design that is not as slick as other Bike racks. The 1 up Bike Rack has many loyal customers. Made very durable the build quality is excellent, and the rack is a good value for the money. The rack can hold 26’’, 27.5’’, 29’’, or 700-C wheels, up to 3.1” wide. For Fat Tire bikes you will need to buy the Fat Tire spacer kit that will Accommodates tires wider than 3.1” up to 4.9” wide. Sold separately. Tilt function for access to trunk but not very user-friendly. RV or Trailer applications have a two-bike max with only the 2-in. hitch-bar models due to the additional bouncing. The 1up rack has a tray and not a trough-like many other bike racks. The bike will roll backward until you clamp on the second clamp making a little more difficult to use than other racks. 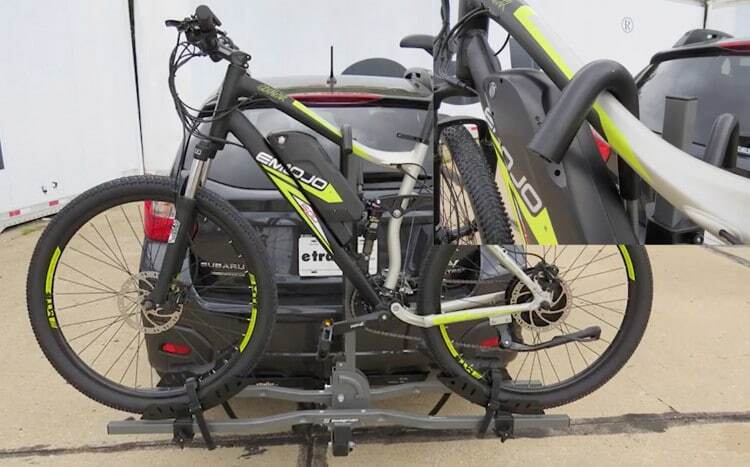 One major downfall with the 1 up heavy duty bike rack is it does not come with any locking hardware and is left for the individual user to buy additional looking devices. It does clamp down with a unique hex wrench that is hollowed out on the end making it more difficult to take off. But the hex wrench can be purchased from 1 up and it will fit any 1 up bike rack. Buy directly from 1 up. Swagman has been making quality bike racks for a number of years. The Swagman E-Spec E-bike carrier is their latest model that has been specifically designed for heavier E-bikes. The Swagman E-Spec Rack can carry two bikes up to 70 lbs and accommodate tires up to 3.1 inches. If you have a fat tire bike you will need to get the optional G10 E-Spec Fat Bike Wheel holders. The center mast folds down so you can access your rear hatch. This allows you to remove anything from the rear cargo area. You can also fold it up against your vehicle to make it more compact if you do not want to remove it. Making it easier to park in the garage without removing the rack. The rack can hold 26’’, 27.5’’, 29’’, or 700-C wheels, up to 3.1” wide. For Fat Tire bikes you will need to buy the Fat Tire spacer kit that will Accommodates tires wider than 3.1” up to 4.9” wide. Fat tire trays are available for 3”-5” tires. RV or Trailer applications have a two-bike max with only the 2-in. Comes with Locking Hooks & Locking Threaded Hitch Pin with the same key. Comes with anti-rattle bolt and lock. For a secure rattle free mount and to prevent theft. Hook locks also add to the security and come with two keys. If you are looking for a heavy duty rack that can handle a few heavy E-bikes the Swagman E-Spec E-bike Carrier could be the right rack for you. See Amazon for pricing. 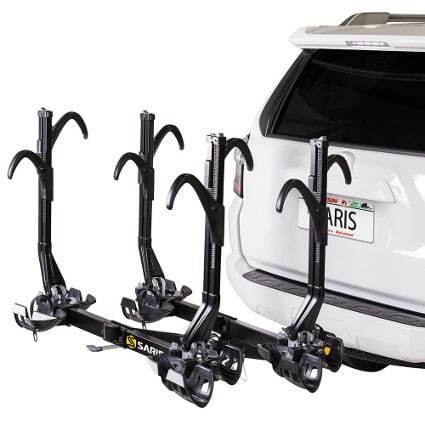 So there you have it six car bike rack carriers that can handle a few heavy E-bikes. Be sure to always remove the battery to lighten the load and to make it a little easier to mount on the rack. Use an addition cover to help protect your bike in bad weather and also act as a theft deterrent is a good idea. Here is a well made bike cover from Amazon. Now that you have a bike rack you can take your bike out for some great adventures in many parks and trails available in your area. If you are a manufacturer or know of other bike racks that will accommodate a heavy fat tire E-bike that is not on the list, please comment below and I will add it to the list. I imagine many bike rack manufacturers are going to have to make heaver rated bike racks to accommodate the growing popularity of E-bike and some newer models will appear. Happy trails!